Petrochemical facilities in the Houston area are assessing their hurricane preparedness after Hurricane Harvey. This oil refinery reinforced storage tank roofs with geodesic domes — the gray caps on some of the white tanks in the photo — to better withstand a deluge. 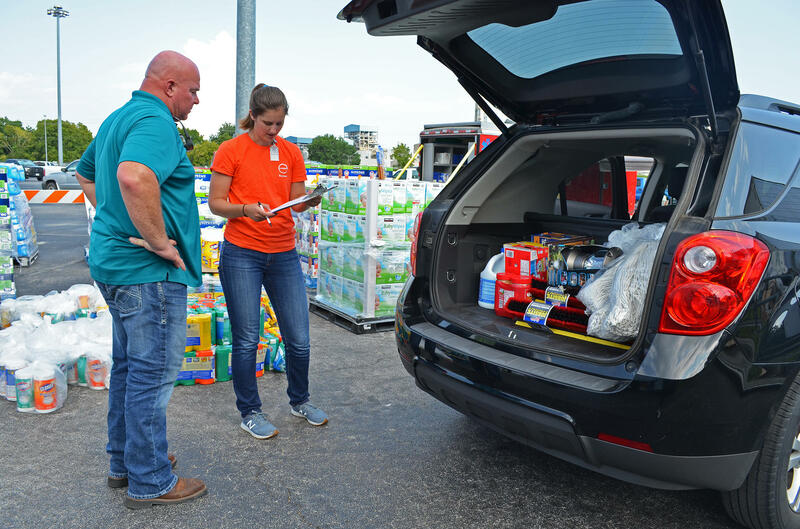 Kayleigh Hogan and Ron Criddle help load vehicles with household supplies provided by the chemical company Covestro to its employees after Hurricane Harvey. The vehicles carry the chemicals and oil for your car, your clothes, your hair gel and your eyeliner, your kid's soccer ball and your mother's hospital IV. And the entire system is sitting in the path of some future hurricane. Last August, Hurricane Harvey dumped more than 60 inches of rain on this region and, in the year since, a lot of companies have been reassessing how they prepare for, and respond to, storms. One big issue is how to keep gas and chemicals safely contained during big floods. Approximately 8 million pounds of extra air pollution are estimated to have been released as a result of Harvey, according to an analysis of public records that the companies themselves reported. "They could have been better prepared than they were this time around," says Bakeyah Nelson, who runs the nonprofit Air Alliance Houston. Pollution was also released into waterways. The chemicals at one company north of Houston caught fire and burned for days. "I think every facility should be taking stock of what happened during Harvey," Nelson says. "Are there even worse-case scenarios that have been predicted or could be predicted? And [firms need] to be very intentional about their efforts in terms of preparing for these situations, which will likely be more frequent in the future." Many companies say they are doing just that. "Where we've had the opportunity, we've been investing in improving resilience of our assets in light of more severe weather events that have been occurring," says Ron Gerrard, a senior vice president at the chemical company Huntsman, which shut down multiple facilities during Harvey. For example, says Gerrard, electrical substations at some facilities were built at ground level 40 or 50 years ago. "Today, when we modernize and rebuild those, they now stand some 10 to 12 feet above ground level on piers," he says, "in order to ensure that they're well above any flood levels, whether its 100-year- or 500-year-flood levels." 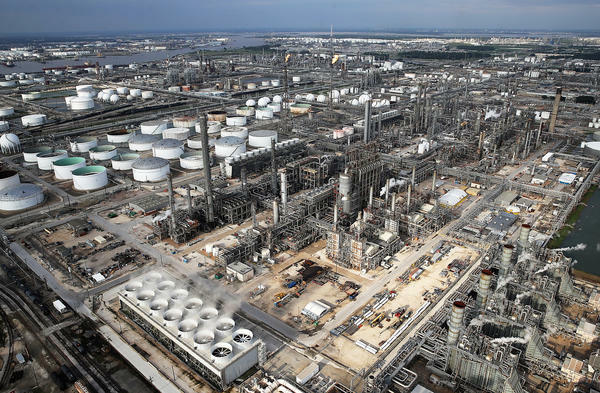 Rod Herrick, who manages a plant owned by the chemical company Covestro in Baytown, east of Houston, says he and his team at the plant reassess their hurricane plans after every storm. "One thing I can say I've learned about hurricanes and tropical storms: There's never one that's the same," Herrick explains. Hurricane Ike, for example, slammed the area with heavy winds in 2008, whereas Tropical Storm Allison caused massive flooding in 2001. Herrick's site didn't report releasing any additional pollution as a result of Harvey, a fact he attributes in part to lessons they learned from Ike. After that storm, Covestro moved critical computers and servers from a building next to the bayou to a building on higher ground. As a result, although their site flooded during Harvey and they had to shut down, they were still able to communicate and monitor what was going on — and to reopen the plant less than two weeks later. Herrick, who is on the board of a regional consortium of chemical plant managers, has also been gathering examples of things that worked well from other companies in the region, something he says hasn't necessarily happened in the past. "Why should it be that I have a good practice, and some of the other sites around this area here don't know what I know?" he says. Some of the information companies are sharing with each other is technical, such as plans for how and when to shut down, or how to move generators to higher ground or install containers under tanks to catch leaks. But there's also more mundane information — for example, which items should employers stock up on before a storm? "Cleaning supplies — it can be mops, brooms, squeegees," lists Herrick. "It can be diapers. It can be feminine items that aren't available. You wouldn't even think about it, but women certainly would! The faster you can help [employees] take care of their personal items, the quicker they can come back to work." "If employees are dislocated or there's a question of whether or not they are able even to work because of some disruption from a natural disaster, that's a problem for the firm," explains Howard Kunreuther, co-director of the Wharton Risk Management and Decision Process Center at the University of Pennsylvania. Kunreuther co-authored a recent book about how companies assess disaster risk and says executives are pretty good at short-term planning and responses to disasters, such as rebuilding employees' homes. "There's a tendency for all of us — not just firms, but individuals — to be myopic," he says, "to want to get something back in the short term to justify an investment. It often takes a disaster to get people to pay attention." For example, Hurricane Harvey has drawn some attention to the tanks many companies use to store hazardous liquids. Many of the leaks during Harvey occurred when the roofs of storage tanks sank under the weight of rainwater, allowing the chemicals below to escape. Some companies are now covering those roofs with geodesic domes — a technology that has been around for years, but appears to be getting more popular as big rainstorms become more common. "You're starting to see them more, which is really good for us," says Juan Flores, whose town of Galena Park is surrounded by industrial sites. "Seeing these dome structures popping up tells you they are being proactive on it. So that's something. There's still pollution, but I can say it's gotten better since the '80s." Flores, the community outreach coordinator with Air Alliance Houston, says he wishes companies communicated more with the public about what they were doing. "During the storm, we didn't know what was going on [or] what we were breathing," he remembers "We live so close, we can hear the alarms inside the plant going off sometimes." Among other things, he says, the companies nearby didn't tell residents whether they were planning to shut down their operations — which releases a lot of pollution — and didn't warn people about leaks until days, or even months, after they happened. During Harvey, that type of information was available to others. Richard Wells, the vice president of Gulf Coast operations for the industrial giant Dow Chemical, says his company communicates closely with local officials during storms. "The county knows our plan," Wells explains. "They know [when a storm is coming]; at a certain time we're going to be completely shut down, cleared of all chemicals and battening the hatches, if you will." Companies also communicate with each other, because many plants rely on each other for raw materials. As a storm approaches, there can be a cascade of plants shutting down, and then restarting when the danger has passed. But when large numbers of facilities shut down in a short period of time, as happened during Harvey, it releases a lot of pollution all at once. And that information doesn't necessarily make it to residents who live on the other side of a fence line from a refinery, or to public health officials who might be able to warn residents to stay inside or turn off air conditioners because those machines draw in outdoor air. Thornton Lee Medley, a longtime pipe fitter at refineries in the region and the president of the United Steelworkers Union Local 13-1 outside Houston, says people who live near refineries and chemical plants deserve to know such information. And not just because of risks from air pollution. "The most dangerous time in a refinery or chemical plant [comes when] bringing it up [and] bringing it down," he says. "I would be very interested in knowing, if I was the general public, when the company had decided to bring the units in the plant down. Because that is when I would be away from my home." "Risk management is not just important for us that are working in the facility," Medley says, or for emergency workers nearby, "but for the entire community outside."